“I will not let age change me, I will change the way I age”! The days are getting shorter and the wonder of cooler nights, colored leaves, and football games are surrounding us with the magic of the season! As Fall is upon us our thoughts turn to last year’s flu and bronchitis season. The 2013-2014 influenza was particularly tough on the 25-64 age group, and experts say we should be prepared for a repeat performance. Prevention: Influenza vaccine and stress reduction. Research says that managing stress is important as it has been proven that a link exists between stress and dysfunctional immunity. Please remember to obtain your flu vaccine and reduce your stress to stay healthy! While we are discussing staying healthy, a great article was in the WSJ, June of 2014, discussing the importance of posture. Hunching is bad for your health. Slouch at your own peril! There is growing evidence that good posture contributes to a range of health benefits, from reducing back and joint pain to boosting mood. 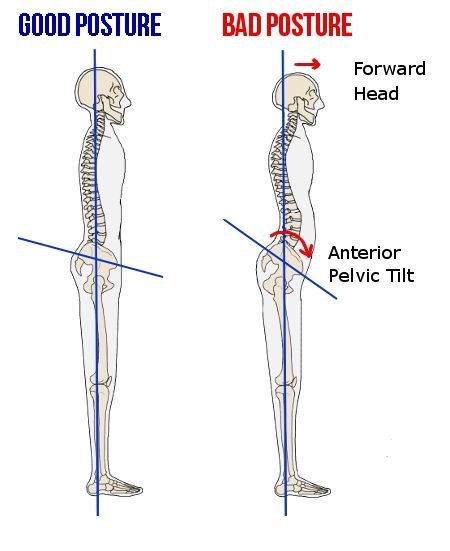 Good posture does not just mean standing with the shoulders thrown back. More important is maintaining good alignment, with ears over the shoulders, shoulders over hips, and hips over the knees and ankles. Body weight should be distributed evenly between the feet. Seated posture, especially while using a computer, is critically important and deserves more attention. The hunched-over position of the typical electronic-device user is of concern and is sparking new back and neck-pain problems in teenagers. Experts at Wake Forest Baptist Medical Center state that posture is the 800 pound gorilla when it comes to health and wellness. How a person is positioned reflects ones satisfaction with ones life and health. Hunching can lead to negative emotions and thoughts, leading to depression. Hunching also makes us look older. Good posture reduces anxiety and inspires confidence. There is ongoing research associating overall health with our posture as well. It takes constant vigilance to improve ones posture and therefore it is not a quick fix. Remember to keep the ears and head over the shoulders. Losing weight, strengthening the core muscles around the trunk and pelvis with help to maintain good posture. Here is the challenge——- keep the ears over the shoulders, the shoulders over the hips, the hips over the knees and ankles. Sit tall, walk tall, stand tall! Must-have Makeup. Shiny lipsticks / glosses are beautiful and give the illusion of fuller lips. Dress up eyes with the modern metallics such as M.A.C.’s Electric Cool Eye Shadow in Gilded Thrill, $21.00. Achieve the radiance seen on the runways by faking a lit-from-within glow. Mix a highlighter into your foundation, then apply only where needed. Rosy blush completes the look. Have a wonderful Fall, enjoy every moment of this majestic season!